One of the main reasons to go to Thailand (aside from elephants and temples) is of course the beautiful beaches of the south. Katie and I are total beach babes so we wanted to take time to relax on the beaches of Thailand. We went to Karón in Phuket and spent two days basically just relaxing and reading and enjoying the sunsets. But we decided to be more active (or active in general), the next two days. 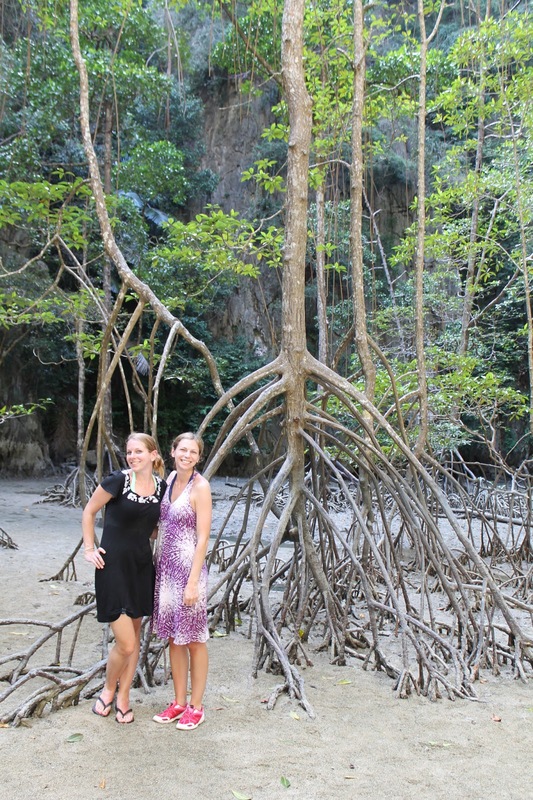 We took two speedboat tours with Phuket Sails Tours in order to easily tour some of the most beautiful beaches in the world. 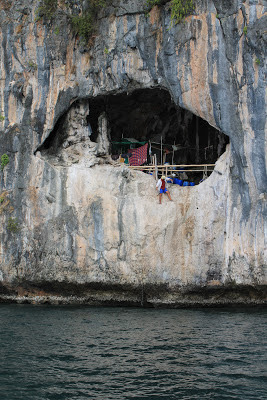 There is a man who lives in a cave on a side of one of the islands. 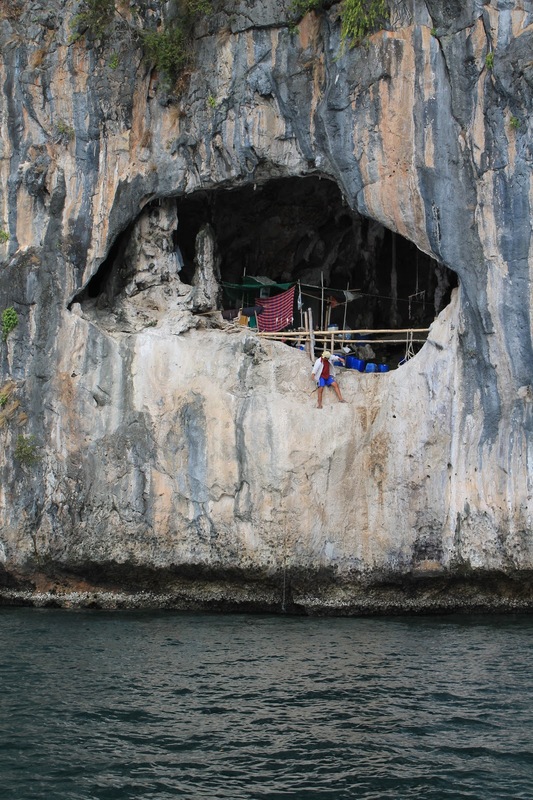 Our tour guide told us they used to throw him fruit and drinks when they rode past, but one time he fell out of the cave into the water while trying to catch a drink and then another time, the soda can hit him in the head. Needless to say, they stopped throwing things to him after that. We stopped by Kao Kee-Un (Drawing Mountain) to see cave drawings from 1500 years ago. Can you spot the fish, monkeys, and mermen in the picture below? 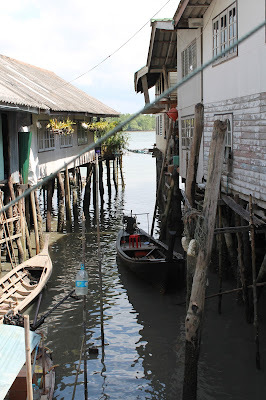 Lunch was at Kao Panyi, a Muslim fishing village where everything is floating, even the school and the soccer field. You can imagine the balance and control the soccer team has, since the field is rocky and you don't want the ball to go out of bounds because then you have to jump into the water to get it. If you'd like to learn more about the village's soccer team, watch this adorable video. We stopped at several beaches to explore caves, find tiny snails, and play in the mangrove trees. We snorkeled at one beach, but I kind of panicked after a few minutes of having trouble breathing. Luckily, I figured this all out the following day. 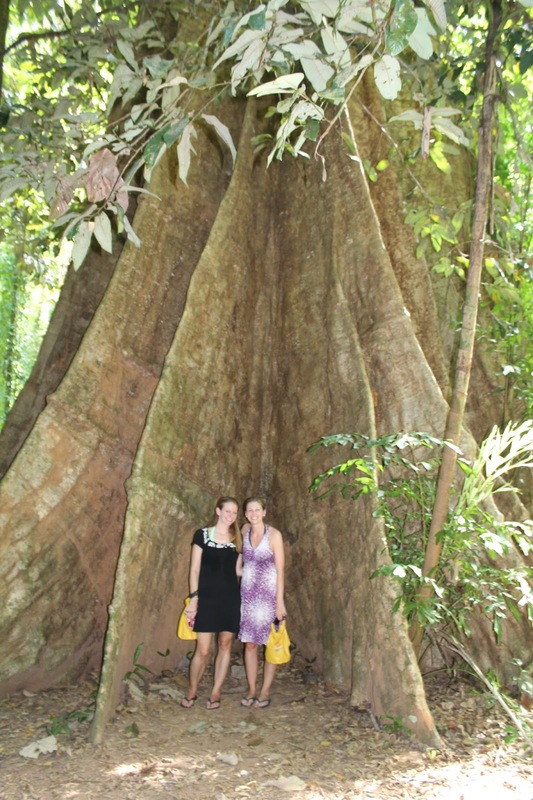 On one of the islands, there was a thousand-year-old bodhi tree that was absolutely remarkable. I also took the opportunity to pose with a giant leaf to recreate a favorite photo from childhood when I wouldn't let go of a leaf during a family photo shoot. My favorite part of the day was definitely when we got off the speedboat and into canoes with our own personal rowers. Sometimes it's a good idea to volunteer to go first and this was one of those times. We were ahead of the pack and got to go through a cave and into a "hidden lagoon" (hong) that you wouldn't even know was there unless you were looking at the island from above. It was so tranquil and beautiful and we were the only ones there. We got a different experience than everyone else because after a few moments, the others came and it filled up quickly. We rowed around for about an hour after leaving the lagoon and it was all pretty fantastic. Oh, and then of course, there were the views. I was rubbing it in to people back home while we were in Phuket because we happened to be missing the coldest week of winter in NYC while getting to explore all these gorgeous beaches. But don't worry, karma caught up with me and I've experienced enough of the crappy weather since we've returned, even as recently as yesterday, when I went outside without knowing it was snowing again. I'll bet it doesn't snow in Phuket. Another reason to love it. PS - Day 2 entry here! Hubba, hubba, picture #10! Sounds like a fun trip, mayb even one of those trips of a life time. Bash getting somebody to cook additionally consists of refreshments and also refreshments. These types of party coordinators deliver refreshments including wines, reddish and also light, shining and also brewskies, and also tones that are neighborhood and also international.